as their 'Draft Day' counterparts. Sonny faced the same battle. He was enamored with the skills of defensive back Vontae Mack, who others felt was more trouble than he was worth. And after a questionable trade to get the No. 1 pick, the Cleveland faithful - including Browns owner Anthony Molina - expects Sonny to nab the alleged best player, hot shot quarterback Bo Callahan. So for many of the same reasons, today real life is mimicking art. Debate rages as to whether the Browns should nab hot shot QB Johnny Manziel (who may be overrated) or reliable wide receiver Sammy Watkins. But it’s more than that, too. The Browns may already have a reliable quarterback in Brian Hoyer. In the film, the fictional Browns also had a potentially reliable quarterback in Brian Drew. Drew was injured halfway through the season, which crushed the Browns hopes. Same goes for the real Browns’ Hoyer. Throw in a crafty, sometimes showy owner (Jimmy Haslam) and a new coach (Mike Pettine), and you start to see why today feels oddly similar to the silver screen. Maybe that’s for good reason. 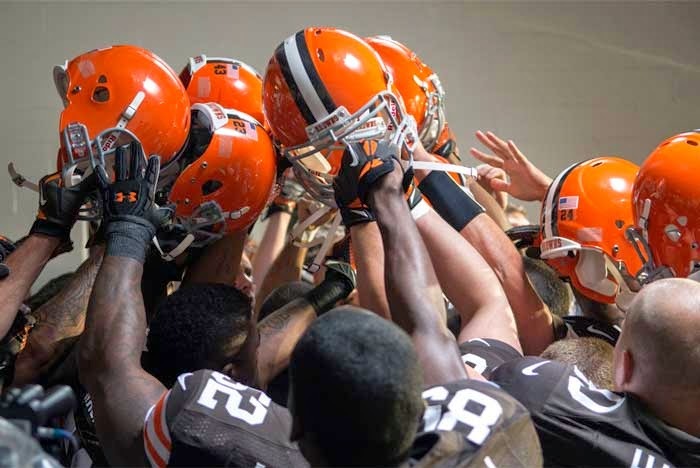 The film Draft Day was written by Clevelander Rajiv Joseph, a Pulitzer Prize winning playwright who has told more than one reporter writing about the Browns was daunting because he was such a fan (he originally wrote the script with the Buffalo Bills as the team with draft issues). And obviously the film was shot here - but last summer, before Hoyer’s emergence from the third string as a possible team leader. Before the unraveling of a promising season and sweeping regime change. Is it possible Joseph was prescient about these Browns and this Draft Day? Could he see into the future of our team - his team - to know what 2014 would hold? I say anything's possible. We’ll know for sure later tonight, if Hoyer still leads the team as the starting quarterback. And if unexpected selections (Mack) are made at the last minute. At the very least, expect more than a couple commentators to compare these Browns with their silver screen counterparts. And that the hope the film gives to fans rings true along the shores of Lake Erie as well.